She showed up beside by my bed at three a.m.
That is an odd phrase, I thought. And I got up and asked questions and chose her some medicine, and scooted over to make space for her in the bed. She slept with me the rest of the night, but when she came downstairs in the morning it was worse. She lay on the couch for the next half hour, crying out, increasingly distressed, caught in the pain, chilled, screaming sometimes, vomiting. We phoned and phoned. Our new doctor was out of the office for the day, and our old doctor’s office said “Since it’s within 24 hours of onset, just have her drink sips of water and wait for the virus to pass. I mean, if she really needs to come in, you can call back to schedule.” I wanted to yell at them. We had promised ourselves last December that if this happened again, we’d know the signs, and we’d drive her to the Children’s Hospital of Pittsburgh ourselves. We’d skip the extra hours of waiting, the ambulance, the double doctor and hospital bills. Our hospital does very little with peds, and transfer was near-guaranteed. So we loaded my daughter into the van. I called around for a sitter for my baby. I grabbed hasty supplies – a toothbrush, a change of clothes for Kelly, a Bible, my breakfast. And my little girl and I set out for Pittsburgh, an hour and forty minutes away. All the way down, as she dozed and retched in the backseat, I second guessed myself. What if it was a stomach bug? But when I could see her again, I knew we were in the right place, and may I say something else? That hospital is amazing. We were met by great staff, checked in immediately, and called back to an ER berth within ten minutes of arrival. And so the long and the short of this story, several tests later, is that my daughter had a second ovarian torsion, exactly like the first one last December, with this difference: it was her left ovary instead of her right one. The chance of a torsion happening at all in a pre-pubescent child, without a cyst or other “cause,” is very small. For it to happen to the same child on opposite sides is just crazy. The managing doctor in the ER had never seen it, and even after the scans, the surgeon was not convinced it wasn’t the same ovary just pulling a number on us. Until he looked for himself. Once again, I called and texted frenetically to keep her father informed. Once again, I signed release forms for laparoscopic surgery. Once again, I kissed her goodbye and watched them take her away. 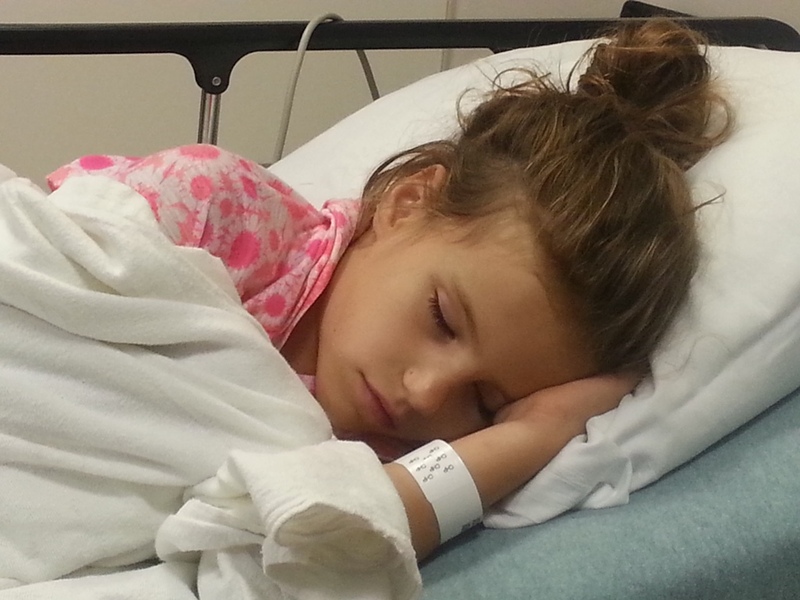 She was hardly awake enough to know what was happening, even before the anesthesia. That is what her body does in this kind of pain: vomits and sleeps. But oh, bless Jesus. While they were in there, they stitched both ovaries in place to keep it from happening again. The release form said they might. “Please,” I said. “If you can do it, please do.” The surgeon looked at me. “Like a time bomb waiting to go off, huh?” he said. You got it, sir. Her timing is awful. Last time, we were four days from her first Christmas program at school, and she healed up just in time to participate. This time, I was twenty-four hours from leaving for an overnight trip to a ladies’ retreat – one of the highlights of my year, and the only event to which I never take a child. And no, I didn’t make it. I kept watching the clock, thinking of what They All were doing without me, feeling wretched for being so selfish and minding so much. That is my confession. As if she could choose, poor darling. Worse, it is our third emergency room visit in nine months, and eats up the money I was hoping to spend to visit my sister in Israel when her baby comes. That is a loss I do not know how to fix. Although there was worry and sorrow, there was far less stress in round two. There was no talk of a mass, a teratoma or a cancer or a rupture. We had a precedent. I am so grateful for superior medical teams who knew what they were doing, grateful my daughter’s fertility is still intact, grateful to live in a generation when it is possible to look inside the human body, and to enter it to fix what is wrong, and to do the entering so unobtrusively that the patient can be up and walking (almost pain-free) within hours. I am grateful to my husband and my bestie and my mom, who kept things running smoothly in my absence and who were all around flexible and wonderful. I am grateful to Kelly for being such a trooper. Most of all, I am grateful this part of her story is, Lord willing, behind us. 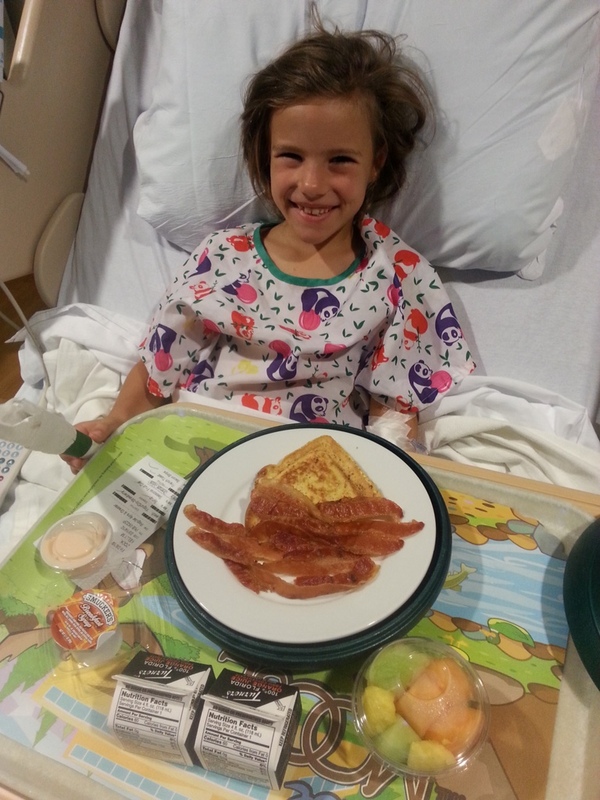 The only good thing about hospital stays: ordering whatever you want to eat and chain-watching Richard Scarry movies. “My life has so many miracles,” she says. And I say, Amen. And please, honey, let’s have no more for a while. There’s little information I can find even on the internet about ovarian torsions, either because they are rare and unstudied or because they are usually accompanied by another condition, such as a cyst, which receives the greater attention and official diagnosis. They’re easily missed as mimicking something else; and uncorrected, they’re both excruciating and dangerous. The speedy intervention of surgery was a godsend both times. Thank you, Jesus! Awww…I’m so sorry. I missed you at Oasis. Now we know why…the sacrifice of motherhood. Blessings to you. You serve well. Aw, you were there? 🙁 I’m so sorry I missed seeing you. O wow. You never know what being mommy will mean next, right? And while pieces of our heart walk around and cause us pain and the willingness to do anything to keep them from hurting, deep down inside we’re still little girls who weep over our own losses; I get it. Hugs to you, and I’m so glad for the miracles! You’re a brave, strong mama. I’m so glad Kelly is okay, and so sorry you had to miss your retreat. Maybe God will make a way for you to go to Israel…or redeem it somehow for you. Thanks, Jenn. I am praying “Lord, help my unbelief” and waiting for the redemption. The living closer, I mean, not the gofundme page – okay, maybe that too. Lol. Love you and wish you were here, sister. Oh Shari, I missed you so much this weekend. You were one of the people I was hoping for a long where-did-time-go chat. But I sure didn’t expect that you had this kind of excuse. So sorry. And I’m hoping that our God of miracles will supply the money needed for an Israel trip. You were one of two people I knew were going to be there that I looked forward All Summer to chatting with, and cried at giving up. I would have loved to see you, Gina. Thank you, sis! You encourage me. I would have loved to have you here – if only! 🙂 & I love you too. Dear Kelly, I’m so happy to see your smiling face at the end of this post– you are brave, and have the bravest mama too! So sorry, Shari, that you missed Oasis too! I was sooo waiting on the report of how all things went there! 🙂 Some day I’ll get there too! Hugs! “All things,” huh? 🙂 I know what that means. 🙂 Next year together, how about that? my pain sometimes, and when I remember my pain, I don’t feel it!! Shari, thanks for sharing. First about Kelly – as a doctor – it is amazing she was diagnosed fast enough to save the ovary the first time and crazy that she had it a second. I’m GLAD they tacked them down! As I was reading I was so scared the story would say she had lost both her ovaries. PTL that she has them both! Second, as a doctor who had to give up my vacation home this summer because of scheduling issues and a new baby being born to a colleague and so missing my mom’s birthday, friends home from other countries, a friends wedding, etc….. I totally relate to the grieving missing Oasis and possibly the trip to Israel (still praying you can go on that one). Even while you are happy for the good for others or grateful for the chance to love on others, loss is hard and grief is real. Anyway, I can be a martyr here — look at what I gave up. It was really good to be reminded that others give up a lot too and have even less choice in the matter than I do. Go Mommy! And now this is really long. Oops. It means to say: Thanks for sharing! Thank you! I always like your doctor-input. And I’m sorry about what you’ve given up too. I find it just like you said – hard to grieve without turning into a martyr. 🙂 And then if I don’t grieve, I turn into even worse things. Bless you. I wish I could think of something clever to say that would fix every issue presented here. I’m so happy that Kelly is still with you, healthy and whole and as charming as ever. And I’m still cheering for that trip to Israel. Children’s is a 5 star hospital, and did you know they give incredible discounts for self-pay? We are finding that out…! I know about 3 ER visits in 5 months time… all for the same child. And he is our calmest one. We are in southern PA but still part of the UPMC hospitals. The one time they recommended surgery and then wanted an ‘an arm and a leg’ for it…we switched hospitals. Nice to know the main Pittsburgh hospital is more on top of the game. So glad Kelly is back to good again. Guess she has anatomy ed that most little girls know nothing about. I was afraid it wasn’t going to end well. The retreat was at SMBI in central PA, an overnight inspirational/ rejuvenating time for women in full-time ministry: pastor’s wives, missionaries, inner city workers, etc.